There is an underrepresentation of academic staff in the discourse around assessment feedback. More needs to be done to understand the experiences of lecturers who often have responsibility for providing feedback. This paper begins to explore the practice of academic staff who work with technology to support feedback provision. It reports on an interview study involving sixteen lecturers working in five different UK higher education institutions; each was using a different combination of tools and technologies. Lecturers describe the decisions made in the formation of practice, and they share the factors that shape both their feedback and their technology use. Influences include underlying beliefs, personal biography, academic identity, and recent experience of family members, collegial networks, and quality management systems. Together these components form an operational feedback ecosystem in which the lecturer mediates the complexity and aligns their choices about feedback with their beliefs and values. The creation of feedback through technology appears to be a work of craft. The findings are especially relevant for academic managers, developers, learning technologists and others who seek to support feedback practices using technology. Despite all we know about the enormous power of feedback to influence student learning it remains a challenging area of academic practice. Literature offers examples of interventions undertaken by practitioners to enhance feedback (see for example Buckley and Cowap, 2013; Chew, 2014; Mathisen, 2012). It also offers models or advice to help practitioners optimize and reflect upon feedback practice (see for example Nicol, 2010) and it gives guidance on facilitating students to become active partners in using their feedback (Price, Rust, O’Donovan, and Handley, 2012). For over a decade though, feedback has consistently been the lowest scored area for student satisfaction in the UK’s National Student Survey. It is suggested that the higher education sector has failed to put theory into practice in relation to feedback (O’Donovan, Rust and Price, 2016). Many university lecturers, often encouraged by their institutions, have taken up technological tools, such as GradeMark, to improve the feedback given to students. Yet we know little about lecturers’ experiences of giving feedback overall, and even less about their experiences of giving feedback using technology. Evans’s (2013) meta-study considered 460 papers on feedback from a twelve-year period, she found that only 7.1% had a focus on the lecturer perspective, compared to 57% that were exclusively student focused. Evans is not alone in making observations about underrepresentation of academic staff views, as the same point is made by Li and De Luca (2014) and Topping (2010). A greater understanding of tutor perceptions of feedback is needed to improve lecturer development (Tang and Harrison, 2011). Literature describes a number of outside forces working to shape feedback practice, including resource pressures (Gibbs and Simpson, 2005), student numbers (Mathisen, 2012), disciplinary expectations of feedback (Hyland, 2013) and movement towards a student as consumer (Higgins, Hartley, and Skelton, 2002). Price, Carroll, O’Donovan and Rust (2011 p. 488) noted the importance of institutional culture in determining feedback practice, they highlight the role of “leadership commitment, power and organisational structures, control systems, as well as a powerful underbelly of informal stories, symbols, rituals and routines often hidden ‘beneath the waterline’ of formal policies and processes”. Literature also tells us that individual beliefs may be important. Approaches to feedback can be viewed as an extension of one’s pedagogic beliefs about the learning process, for example behaviourist foundations lead to an emphasis on summative and norm referenced approaches and constructivist approaches lead to a more personalised approach (Ellery, 2008). Lecturers have their own beliefs and attitudes to feedback, but they appear to operate in a context with multiple forces working to shape their feedback strategies. A provisional notion of lecturers being at the centre of a feedback system can be conceived. This paper reports on aspects of a doctoral study that investigated lecturers’ experiences of giving feedback through technology. By exploring individual experiences, the characteristics and dynamic processes of the feedback system are revealed. The research set out to show a range of practitioner experiences and does not focus exclusively on champions of technology. The world ‘in me’ i.e. within an individual’s own values, beliefs and history. Structures shape situations in which individuals find themselves; these factors give rise to constraints and enabling factors. Agents form their own concerns and priorities, and projects. Agents reflect to subjectively find a way forward. Archer’s model reminds us that in seeking to understand the experience of lecturers, consideration of the structures and influences upon them is needed, but also a full exploration should seek to understand lecturers’ concerns and responses. These principles guided the format of the study. Sixteen narrative interviews explored the feedback and technology practice of individual lecturers. While feedback has many definitions, here the focus was limited to formal feedback on written performances. Formal infers either summative feedback, or feedback which is a common and planned part of a student cohort’s learning. The interviews set out to explore values, practices and also any hidden forces at work within the lecturer’s feedback experience. The sampling strategy was emergent (see Table 1). The initial interviews were in my own institution, which is a small specialist, single campus university. External cases were then located to compare the internal findings and to generate new insights, particularly in relation to the role of specific institutional practices and cultures. The external universities were all larger metropolitan universities and the disciplines and technologies represented were diverse. The specific technologies used by those interviewed included: GradeMark™, Microsoft Word™ Comments, Microsoft Word™ Track Change, Jing™, Pebblepad™, Screencastomatic™, PDF Annotation, audio recording, Adobe In Design™ and Dragon Dictate™. The tools themselves are not explored as the research focus transcends individual technologies. The interviews all followed a similar format with interviewees telling their own story of how they became involved in using technology in feedback, and how they developed their practice in a chronological sequence. The interviews were semi-structured to offer similarity of coverage, but emerging ideas did lead to later interviews having some additional questions. Separate interview schedules were developed for those not using technology. These included collecting views about feedback beliefs and technologies, but they also focussed on why technology was not selected for use in feedback. During the interview process I tried to assume a neutral position whereby asking questions about the avoidance of technology was inquisitive rather than accusatory in tone (with inference that a lack of technology could be a practice deficit). This was hugely important in ensuring that participants did not feel judged when being asked about why they did not undertake certain practice. 3 Four lecturers who used technology in feedback; external cases. Purposeful convenience: To achieve external viewpoints, and to further understand the role of context specific factors in the formation of practice. The cases were recruited through mutual contacts. These participants were not previously known to me. Journalism, Graphics, Education, Medical Science. Within critical realism causal explanation is revealed in the connection between ideas, and through rich detail. A lack of regularity does not prevent claims of causation (Gorski, 2013). With this in mind, the interviews were analysed in two ways. First, individual stories, known as portraits (Seidman, 1998 in Maxwell 2012), were created to understand the influences, processes and decision making for each lecturer. Portraits are a condensed form of the individual narrative, which shows the essence of each case through a reduction process. The reduced narratives seek to highlight any causal connections within an account by reducing the words to the key underlying messages. As a separate strand of analysis, transcripts were coded to identify themes. Coding was largely, but not entirely open. Some themes from the literature of feedback practice were used to give clues and direct attention. These were used to provide high-level codes, which framed more detailed open coding. For example ‘lecturer beliefs’ was a high level code generated by literature, but the data was used to generate the different beliefs that were evident. During the open coding process these initial codes morphed and emerged to fully reflect the data. The insights revealed through practitioner stories are much more than a list of influencing factors. Using the critical realist principle of stratification to seek out the nuances of the feedback experience and context, an interconnected system can be seen. In this system there is a relationship between individuals, as well as between individuals and their environment; there are resource challenges; the introduction of new elements, including people, ideas and tools, can trigger change and disturbance; there is diversity and tension too. The dynamic arrangement described here is like an ecosystem. This is captured visually in Figure 1. At the heart of the model is the individual practitioner with their own beliefs, experiences and identity. Another layer shows an immediate space of social practice wherein new practices are shared, incubated and nurtured, whilst other practices are challenged. Social interactions influence individual decisions to use technology for feedback, the type of technology selected and the way in which tools are used. Social contact was also important in shaping attitudes to feedback per se – with new staff influenced by established colleagues, or established colleagues influenced by those who have been exposed to new ideas. The sources of social influence appeared to differ between institutions. A further layer shows the structures and practices that make up the institutional landscape. Finally is the layer of factors that operate from ‘out there’. These factors were not overtly cited as influences on practice, but they were evident in the interview narratives. By example widening participation was present as lecturers describe the different types of student groups that they needed to assess (including in-work based learners); internationalisation was present as lecturers described changing their assessment practices to meet the needs of specific international cohorts of students; and the fee environment was hinted at, as lecturers described the perceived pressure of meeting the expectations of paying students. Aspects of the ecosystem are hereafter described. Points are presented where they appeared significant across multiple interviews or where they appear significant to an individual story of practice. Lecturer 6 observed that the changing fee environment had led to his perception that students have higher expectations. He was also aware that the quality policies attribute great importance to formal feedback. He was aware that institutions are conscious of feedback through performance data and are promoting associated professional development. Participation in staff development raised consciousness of higher feedback expectations, while external examiner feedback reinforced the need for legibility and high standards. Legibility was seen as a way to better meet student expectations in a changing external environment and to meet quality requirements. Lecturer 12 experienced a workload increase associated with more employer engagement courses and rising student numbers. He felt that student expectations of technology were rising, as institutional messaging of this point was clear. A pressure to produce quicker feedback, and technology-enhanced feedback is experienced simultaneously. All lecturers claimed that feedback was important. All accepted that feedback was a complex business and all felt unsure whether students used feedback. All held personal theories of why feedback was not always used. Beyond these areas of commonality, two distinct belief systems were noted through the analysis. To locate these belief systems, all of the codes relating to each of the feedback beliefs were listed for each lecturer. It became clear from this that there was a great deal of overlap (i.e. around feedback complexity and usefulness), but also some key points of difference particularly around student use of feedback and tutor influence. The two belief systems are described as orientations. Lecturers displayed hope that students would sometimes use their feedback and they believed that the quality of their feedback was an important influence on student use. The blend of ‘hope’ and ‘belief in tutor influence’ provides conditions in which lecturers have confidence that an investment in feedback is worthwhile. All but one lecturer with this belief saw technology as a way to make a difference. Lecturers reported that the ‘difference’ might be made through increased accessibility, more engaging modes of delivering feedback, delivering feedback quicker, or through a matching of feedback media to learner preference. Lecturers selected their technology to enact their specific beliefs about how to improve student use of feedback. Lecturers in this category believe that whilst feedback is powerful, their ability to influence student use is limited. Lecturers with this belief set framed feedback as a professional duty. In these cases technology was used to enhance the quality or speed of supply to enable lecturers to meet their professional responsibilities. These two categories were not mutually exclusive. It was possible to have both a belief that the tutor can make a difference and a strong sense of the need to deliver good feedback. Every participant who used technology displayed at least one of these orientations. Of the two participants who did not use technology, one displayed both feedback optimism and professional responsibility, but did not turn to technology as a way to enact the values. For him, technology was not the way to show professionalism or engage students. The other rejected ‘official feedback’ seeing it as not necessarily useful for students. Lecturers’ beliefs about technology, and their related practices were categorised, and five descriptors were formed (see Table 2). As with the feedback beliefs, the profile of codes associated with each lecturer was explored for similarities and differences. The emerging categorisation of user-types was then sense checked back to the narrative portraits; this ensured that the codes had not worked in a reductionist manner and that the typology resonated with the thick-description of the stories. The names of the categories were chosen to be as descriptive as possible, with participants own words being borrowed to capture sentiment (in the case of the ‘have a go-ers’ and ‘when it really matters’). You need someone like Dawn saying come on guys; it’s not as hard as it looks (Lecturer 12). June would have had a big influence on [getting started with technology] …I was giving it a go simply because she was doing it and she’s making it work (Lecturer 6). While super-users appeared to be motivational, they also provide a reference point for other lecturers’ self-effacement. Three lecturers cited their own abilities in a depreciating way when in-mind of the super users. One even referred to herself as a ‘complete idiot’ with technology in comparison to Dawn. Communications that cite super users also appeared very influential in determining practice. When super-user ‘June’ questioned the time involved in GradeMark, one of the interviewees was then reluctant to engage with this technology. The only super user who was interviewed was sensitive to his power and in response he sought to generate evidence of the benefits of different technologies. There’s only so many hours in a day and you’ve got to make decisions about what you’re going to do with those hours and what’s going to be best for both your students and for yourself and your career … I think some colleagues have got kind of drawn into IT, and they do a lot of work with IT, but then five years later, they’re wondering why they’ve not been [promoted], and it’s because they’ve not been putting time into the [research] (Lecturer 11). The other lecturer who didn’t use technology in feedback (Lecturer 10) linked this to her proximity to retirement which meant a return on her investment of time would be limited. By contrast other lecturers (Lecturers 7 and 13), who were just starting their careers, were keen to bring change by setting an example to more experienced colleagues. Lecturers with children in education used their family’s experience as a reference point for conceiving their own feedback practices. Two had an awareness of the speed with which feedback was given using semi-automated marking in their children’s universities (Lecturers 2 and 12). Another rejected the depersonalized pre-populated comments that his own children found unhelpful in school (Lecturer 11). Family experiences appear to give rise to personal theories about the effectiveness of different approaches to giving feedback. Lecturers’ personal media preferences appeared to influence engagement with technology. Two lectures particularly disliked audio because they both identically stated, “I don’t like the sound of my own voice” (Lecturers 2 and 3). They reject audio feedback even though they believed students would find this useful. Another cited her own preference for visual learning as a reason for employing annotative techniques (Lecturer 1). Previous employment experience exerted an underlying influence on feedback beliefs and technology attitude. Those lecturers who had worked in industry imported the standards and expectations associated with their previous role, for example one lecturer explained: “a lot fed from my consultancy work because there’d be quality assurance … and that invariably would be a Word document …therefore, I’m very familiar with the approach” (Lecturer 5). Another (Lecturer 7) had been a horse-riding instructor, and described how she imported an emphasis on immediate corrective feedback. I have to present it in a positive and upbeat way, when I’m actually thinking I’m on my fifty-fifth [submission]… and actually I can’t keep maintaining that positivity that you need verbally to be able to do that for that number of students (Lecturer 5). I found that I have tried to develop it because recorded voices can become a bit more maternal (Lecturer 2). One lecturer who preferred text, but who had experimented with audio, recognised that his text based feedback removed the emotional signals which indicated the good intent of his comments. The benefits he had realised with audio were not replicable in his preferred media. Following his experience with audio, he began to explicitly inform students, via a note at the start of their feedback, that his comments were made with good intent. It appears that feedback is a work of emotional sensitivity, and lecturers consider this in their use of technology and in their formation of feedback. Experimentation with different media can help revise existing practices, even when the new technology is not adopted. Lecturers adopted the practices of close colleagues especially when they were new to higher education; a process of acculturation occurs as lecturers seek guidance and open themselves to the influence of others. Lecturer 9 described how he was ‘shown the way’ by colleagues regarding the purpose of feedback. Like a feedback meme, practice is passed on. He ‘landed’ in a co-located team with particular ways of working and these were quickly passed on. The pairing of new staff with existent staff could be seen as a strong formative influence on feedback outlook. Experienced practitioners had their practice shaped by the addition of new staff into existing teams. One veteran lecturer described how two members of his module teaching team imported ideas that they had encountered during their post-graduate teacher-training programme. A high degree of trust was needed in the new staff when the experienced practitioner was unfamiliar with the technology, and likewise social confidence was needed on the part of the new team members to take the lead. Collegial social engagement provided compensatory support where individuals lacked confidence to engage with technology. Professional development opportunities were also cited as a way in which new ideas for feedback, and particularly use of technology, were formulated. The results of professional development relating to technology for feedback were variable. For some, technology was encountered and stored in mind until an opportunity to use it materialised. For others, technology was encountered and was intuitively appealing and while no obvious need was served by its immediate employment, opportunities to use it were actively sought. In some other cases technology was encountered in a situation that does not relate to feedback, but the tool’s potential to assist with feedback was identified. We’re a little bit separated… We tend not to have time to go over to the other side [of campus] and talk to people, so it tends to be just us talking, and we do a lot… it’s nice because we do have quite a close-knit group, and we do talk a lot about feedback, about what we’ve been doing (Lecturer 7). [T]he best ideas happen at the coffee station (Lecturer 2). When we started out [developing the programme] … we locked everybody in the room … until we came into some consensus about a pedagogical approach that we would adopt. Once we got our agreement then we took it forward as a team so [students] get … continuity (Lecturer 16). Within course teams different processes of determining feedback methods were evident. One reported a discursive and collegial approach to determining feedback strategies (Lecturer 16), where priority was given to using feedback tools to extend opportunities to practice behaviours such as listening to oral communications. The other team had a more managerial approach with course leaders setting the path for the feedback strategy (Lecturer 15). Support from specialist e-learning teams was important to all. For assistance, lecturers would turn to both central teams and those that they informally identify as the technology leaders amongst the academic staff. For one of the self-declared ‘dinosaurs’ engagement with the e-learning team opened the door to dialogue about other uses of technology in teaching. Lecturers in all institutions had procedural uncertainty when using technology for summative feedback. Four lecturers struggled to meet the requirements for anonymous marking whilst using GradeMark™ and in response one postponed the use of technology, one worked with improvised solutions to adhere to the rules (using stickers on screen to cover up names), another tried to locate a technical solution and the fourth carried on without anonymity concluding that that the technology or rules would need to catch up. The reaction of the individual lecturer appeared to be linked to technical confidence and professional experience. [The feedback approach] is not being driven by the quality agenda … but obviously it has got to be done with that in mind. Clearly one of the things in terms of the transition from written to the audio to the screen cast has been to consult with external examiners (Lecturer 16). While Lecturer 13 complied and Lecturer 16 negotiated, Lecture 14 worked as a change agent by advocating the university systems be changed to be more permissive to aid staff take up – again these leadership actions reflect his super-champion profile. The role of ‘second markers’ provided another challenge. Some lecturers reported that second markers did not cooperate with the first assessor’s choice of technology. For some, this was an opportunity to advocate the benefits of their chosen technology; others felt like they needed to adapt their practice to work with the immovable preference of the other markers. Lecturer 7 described how she encountered reluctance to technology use in second marking, but that she was “putting her foot down” about expectations in this area and explaining to colleagues that students value this approach and therefore they should support the process. The quality management system clearly shapes feedback practice, especially with technology choices. However it is important to note that individual staff respond differently to the same environment. In some cases the individual lecturer is active in seeking to change rules. An appreciated benefit that pleased lecturers even though it was not their primary reason for using a specific technology. An aspiration as practice developed. Efficiencies were actively pursued as proficiency grew. Lecturer 6 described how his practice evolved: “When you’re marking you tend to find a lot of repeats. Some missing this and some missing that, so once you’ve typed it out so you can just edit …So re-using bits. I’ve got a little technique I’ve just devised”. A relative concept where the search for efficiencies was traded off against personalisation and depth of feedback. Lecturer 12 was dissatisfied with recycled comments, so he added audio into his feedback to aid personalisation. Lecturer 6 moved from a system of pre-made comments, to a realisation that he needed to customise, as a result he then moved to adopt dictation software to speed up the personalisation process. A veto, so that when a technology is too burdensome it is rejected. Time and efficiencies are key components within lecturers’ practice narratives; however the concept of time is regarded differently by different lecturers, and regarded in different ways at different points during the journey of developing practice with a specific technology. some of the feedback here is absolutely fantastic. But …I’m paid the same as other staff who aren’t looking at technology and they don’t want to and they’re not interested. [some colleagues] purpose is to get through the process as quickly as possible, … certainly having seen this, having second marked work of other colleagues, I just think is appalling. The coding process showed a co-presence of ‘institutional change’ and ‘fractured practice’ (the code given to discord). Lecturers appeared to be looking for an institution led solution to creating a more equitable situation. The non-users of technology also felt tension; there was frustration that technology was too dominant in practice at the expense of dialogue and face-to-face contact. The ‘super-champion’ sensed tension from colleagues who did not want to utilise technology; he recognised that his approach was not universally applauded. Evidence of some discord was in all institutions represented. 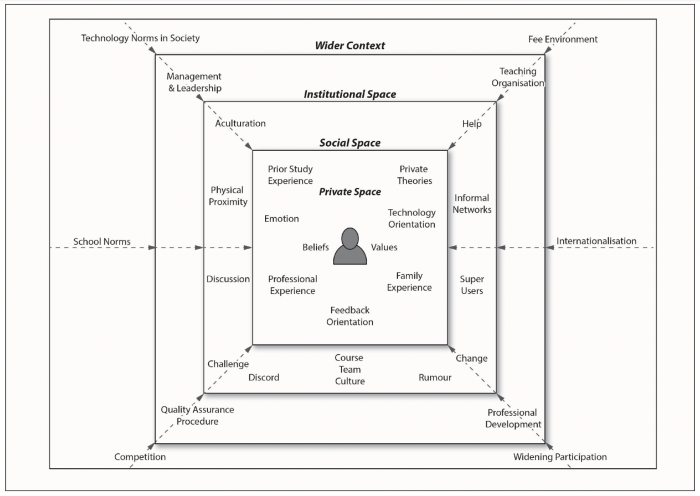 The ecosystem model highlights a range of factors that exist within the experience of lecturers, though many of these factors are not new. For example, Opre, Zaharie and Opre (2008) attributed technology resistance to academics being in the latter stages of their career, while multiple authors recognise the resource pressures associated with feedback (Gibbs and Simpson, 2005; Mathisen, 2012). Notably though, lecturer emotion and the role of biography are less well attended to in literature. The ecosystem alone is insufficient to articulate the practice of feedback. When the reflective deliberations of lecturers are added the picture becomes more complete. Synergy can be seen between the development of feedback practice using technology, as shown in Figure 1 and Archer’s (2003) three stage model of mediation, introduced earlier. The process system in Figure 1 is brought to life by the three-step process, which is summarised in Table 3. Structures shape situations in which individuals find themselves; these factors give rise to constraints and enabling factors. The feedback context has been shown as being partially determined by both hidden and overt forces. The ecosystem gives rise to constraints on practice (such as quality assurance rules and the organisation of space) and enablers (such as the formal staff development programme). The constraints and enablers can be experienced directly, for example by the limitations of social spaces and colocation, but they are also experienced through social activity as interactions with colleagues brings to life realisations, for example about the importance of competition and accountability. Agents form their own concerns and priorities, and projects (this is a subjective part of the process). As a product of personal values and beliefs and experiences, lecturers create plans to resolve particular challenges or enable their values and beliefs to be realised. These plans sometimes include technology. Some of the concerns that give rise to the formation of priorities and associated actions, are triggered by social processes, which themselves shape values or highlight concerns. Agents reflect to subjectively find a way forward (this is a fusion of objective concerns and subjective considerations). Faced with the influence of constraints and enablers and with the inner compass of beliefs and values, the individual practitioner has to find a way through. The navigation and negotiation of different factors is supported by private deliberation, but also by social engagement. Critical realist principles here are successful in illuminating practice but similarities can also be seen with Christine Hockings’ (2011) notion of the artisan teacher. She describes the artisan teacher as holding a reflective capacity to work with complexity, being able to locate and reflect upon the factors which give rise to their attitudes and behaviours, such as their biography, and as being able to navigate through challenges of academic practice while remaining authentic to their beliefs. While Hockings’ work was specifically looking at inclusive practice, rather than feedback practice, there is evidence of a similar internal reflexivity guiding the individual practitioners through complexity. As with Hockings’ example, within the feedback context it was also the case that factors beyond the control of lecturers invade and shape time, priorities and objectives. On the basis of the evidence presented, it is proposed that feedback can be conceived as an act of craft; something which is negotiated, which is a product of great skill and deliberation, and which is a social, environmental and personal fusion. Conceiving feedback as craft, as something intensely personal to the lecturer as well as the student, could be transformative in how feedback is spoken of, managed and developed. The nature and process of internal deliberation is worthy of more research if this process is to be more fully understood. Different institutions may have different ecosystems determined by institutional culture, leadership style, policy, physical layout, staff development approaches and other factors. Nevertheless the feedback ecosystem model may resonate with others, and it may be used to trigger discussions about feedback practice or the specific use of feedback technology. It is recommended that those charged with improving feedback practice, particularly through technology, should take time to understand institutional culture and to locate, to return to Price et al. (2011), what is happening “beneath the[ir] waterline”. This deeper level of engagement will enable more tailored support, and a fuller appreciation of the experiences of colleagues.